Dr. Amos Pollard, chief surgeon of the Alamo garrison, was born 1803 in Massachusetts. In 1834 Pollard traveled to Texas by way of New Orleans. He took part in the fight for the Gonzales “come and take it” cannon, the opening skirmish of the Texas Revolution, on October 2, 1835. He later marched on San Antonio de Béxar as a private in Capt. John York’s volunteer company. 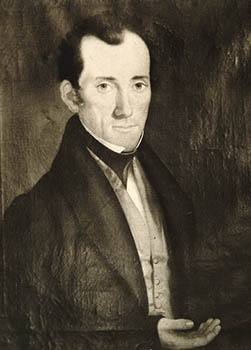 On October 23, 1835, he was appointed surgeon of the regiment by Stephen F. Austin. After the Siege of Béxar Pollard remained in the town as chief surgeon of the Texan garrison, on the staff of Lt. Col. James C. Neill. He cared for the sick and wounded of the garrison and also set up a hospital within the Alamo. On February 23, 1836, Antonio López de Santa Anna’s Mexican army besieged the Alamo. A portrait of him was done sometime before he moved to Texas. Besides Travis, Bowie, and Crockett, he is the only Alamo defender of whom a portrait was done from life. A copy of the portrait is on display in the Alamo. Pollard died in the battle of the Alamo on March 6, 1836, probably defending the Alamo hospital.